The Case entity has the built in capability to use Service Level Agreements (SLAs). Often SLAs are in place to contract a service delivery time for a customer, however we will be using it for a slightly different purpose in this example. This tutorial assumes you have basic knowledge of the Case entity, sending Emails, and Workflows within Microsoft Dynamics CRM. 3. Name your new Customer Service Schedule and add a Description. 4. 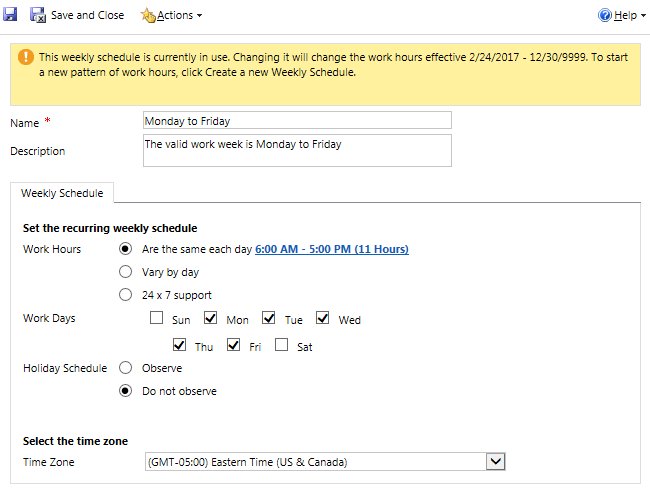 Choose Work Hours and Days which correspond to the company’s working hours and click Save and Close. For the sake of this example, I have chosen Monday – Friday, 6am to 5pm. If we do not add a Customer Service Schedule, the SLA would count Saturday and Sunday towards the countdown time, but we want to restrict it to only count work days. Navigate to the main Case form in your Solution to ensure the SLA KPI fields you require are on the form. I have kept the default Applicable SLA(STANDARD) Section which includes “First Response By” and “Resolve By” under the Summary tab. Let’s choose a field to be our flag: we will change it when the record is assigned. Add “First Response SLA Status” to the form. Its default value is “In Progress”, and we can change it to “Succeeded” when the record is assigned. Create the SLA: You can create a new SLA through the Solution, or by navigating to Settings > Service Management > Service Level Agreements. 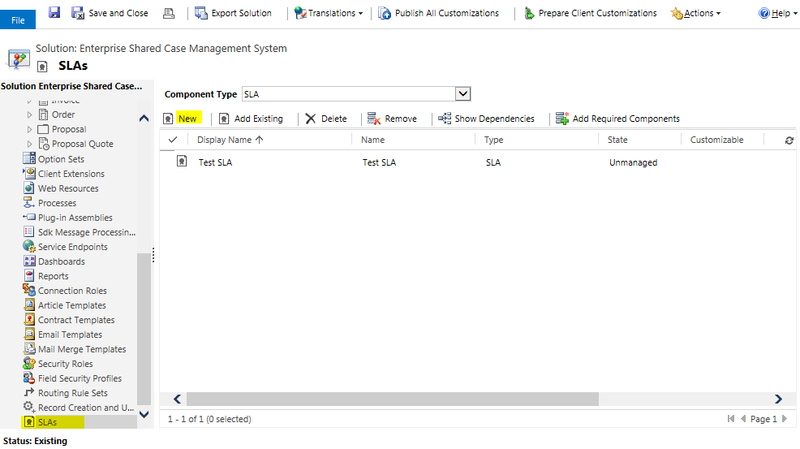 Name your SLA and choose the entity – we are choosing the default Case entity, but as of CRM 2016, other entities can have SLAs enabled for them as well. 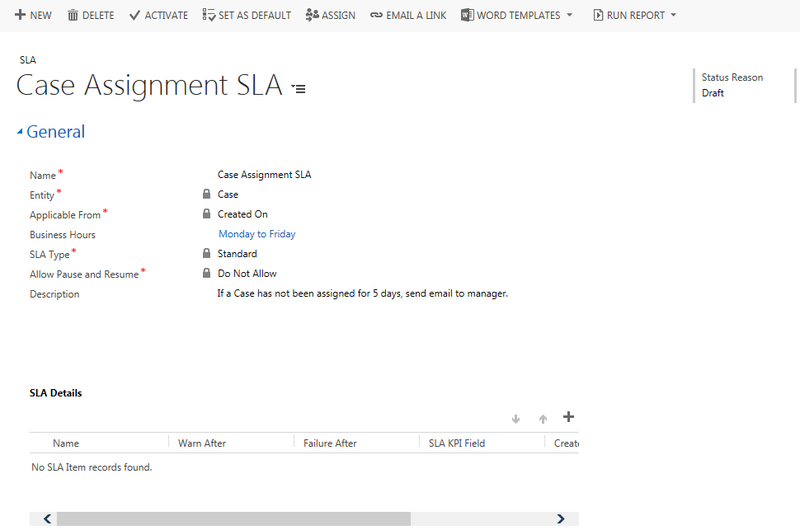 Enter the details for the SLA such as Business Hours, the Type and Description. I chose Standard because we do not need the ability to Pause and Resume at this time, which an Enhanced SLA would allow us to do. As well, this SLA will be “Applicable From” creation of the Case. 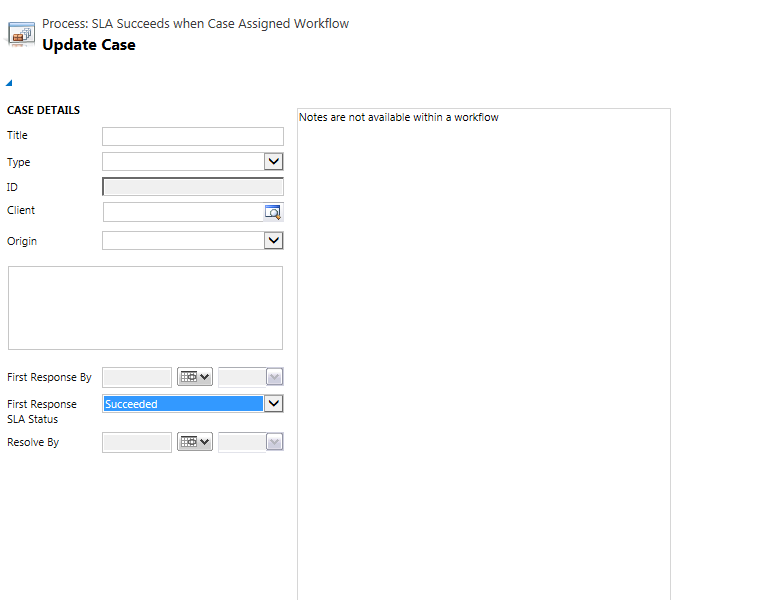 Under SLA Details, click the ‘+’ to create a new SLA Item where we will configure our workflow logic. The Related Case Field is where you choose a Date/Time field which will show the “due date” or Failure date/time on the form. 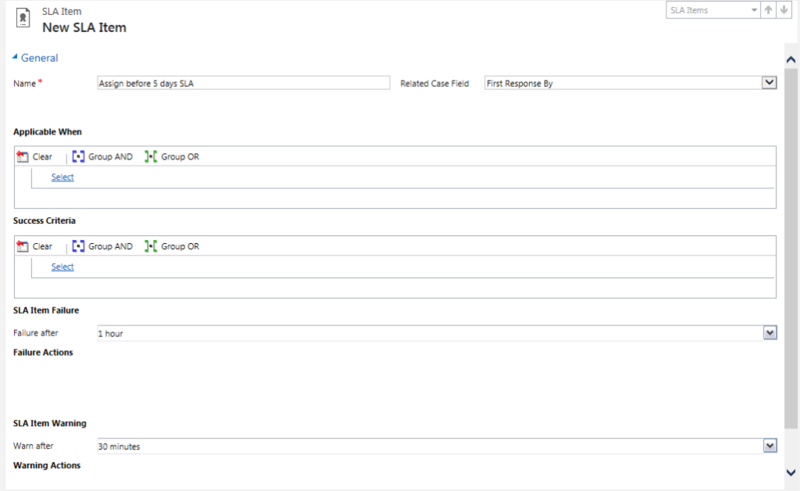 You can choose any Date/Time field, but I stuck with the default: First Response By. The “Applicable When” section defines when the SLA should activate. As we want it to be active on all cases, no matter the priority, we will leave it blank. The “Success Criteria” section defines what logic must be met for the SLA to succeed and stop counting down. 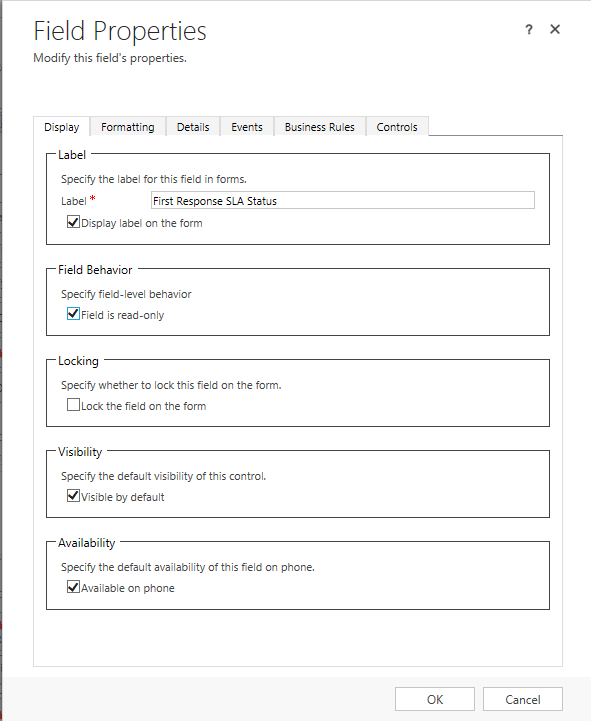 In our case, we have added the extra field “First Response SLA Status” to the form. Let’s stop the SLA when the value of that field on the Case form equals Succeeded. To finish up our SLA Item, we need to set up a Warning or Failure action. In our case, we want to send an email to a manager if the case has not been assigned within 5 days. In other words, if “First Response SLA Status” is anything other than Succeeded, the SLA will Fail after 5 days and send the email. Set “Failure after” to 5 days (the max in the drop down ends at 3 days, but you can manually edit this field) and Add Step “Send Email” under Failure Actions. Set the properties of your email to send whatever message you choose, and send to whomever makes the most sense. No Warning is needed for this example, but you could choose to have an action occur before the Failure date to warn the user. 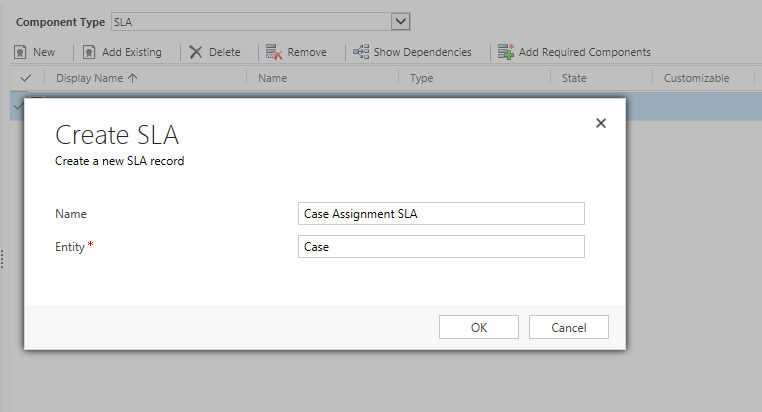 Our SLA will succeed when the field “First Response SLA Status” equals “Succeeded”, so let’s create a workflow that sets the field when the Case is assigned. Navigate to Processes within the solution and choose “New”. 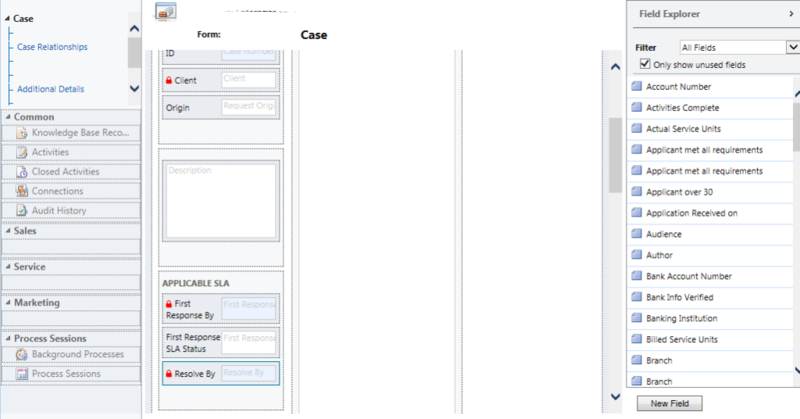 We’re going to create a Workflow(Category) for the Case(Entity). 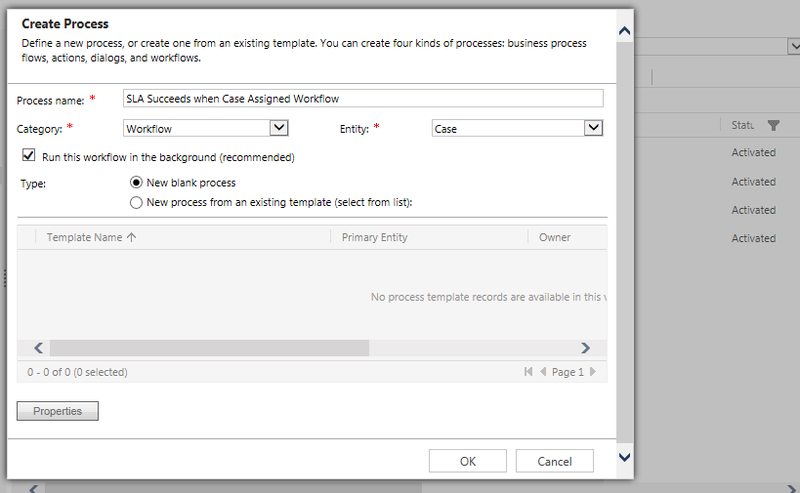 If you want the field to update automatically (Real-Time Workflow) and stop the SLA within seconds, uncheck the “Run this workflow in the background” box. I have left it checked as an Asynchronous Workflow will work fine for this example. We want this workflow to change the value of the field when the Case is assigned. In order to set the trigger, we can choose to “Start when:” Record is assigned. Now we can change the value on the form. Click “Add Step” and choose to “Update Record”. After selecting Case, click Set Properties to set the value. Let’s change the status to “Succeeded”. Save and close. Don’t forget to publish your changes! As a last step, let’s change the “First Response SLA Status” to read-only on the Case form, so no one can manually change it to succeeded. At work I had the task to create a button on the main Email form that would trigger a workflow. Our client wants to be able to review a few draft emails, then press the button to iterate through all draft emails and send them. Navigate to your solution and create a HTML New Web Resource. Open up the Text Editor (or something like Notepad++) and create your button by adding HTML to the Source tab. You can preview your button on the Rich Text tab. It can be as simple or as detailed as you want it to be, here’s some barebones code. 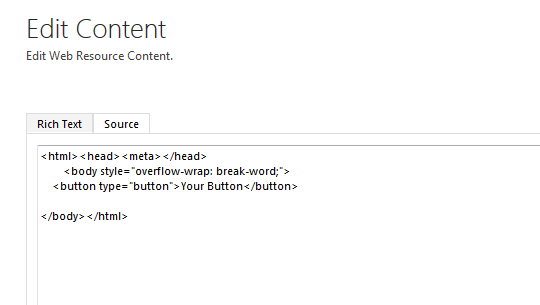 After you save your web resource, Dynamics automatically adds a few tags. 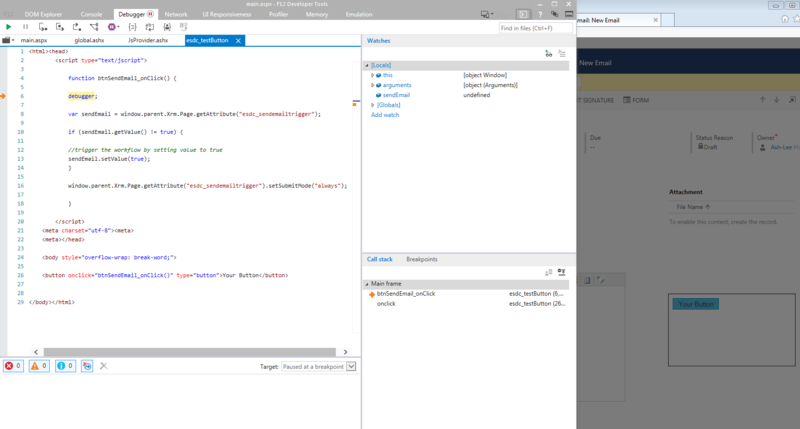 var sendEmail holds the Attribute “esdc_sendemailtrigger” which is a Two Option Set. We then check if the value is “No”. If it’s “No” (false), set to “Yes” (true). My custom workflow is triggered on the field change of “esdc_sendemailtrigger”: if it’s set to “Yes” the process is run and then it sets the value back to “No”. I added the .setSubmitMode(“always”) to ensure the value of the field is changed immediately on the click of the button. Lastly, don’t forget to call your new function “changeFieldValue_onClick” to your HTML button’s onclick event. Publish All Customizations (<– very important step!). Okay your button is ready for action! Go ahead and pop that on any form or entity of your choosing. The field I want to change is on the Email entity’s Main Form, so I’ll put it there. 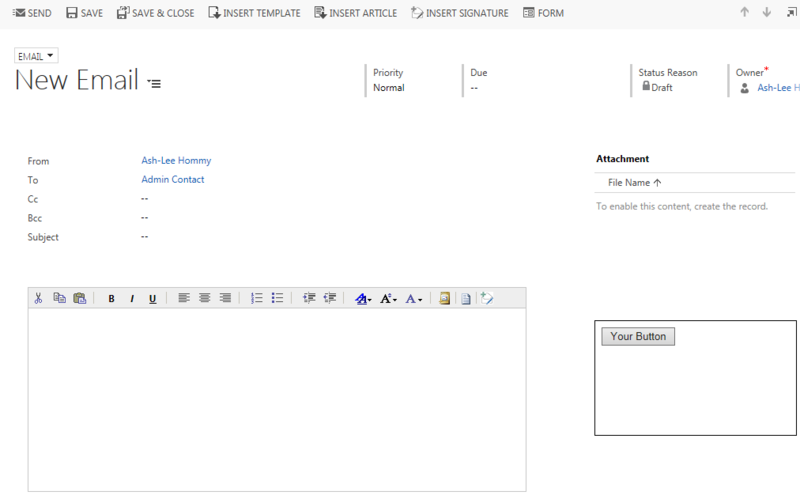 Navigate to the Insert tab on the Form Editor, choose a section and press Web Resource. Find your new button in the Lookup, give it a Name and optional Label. 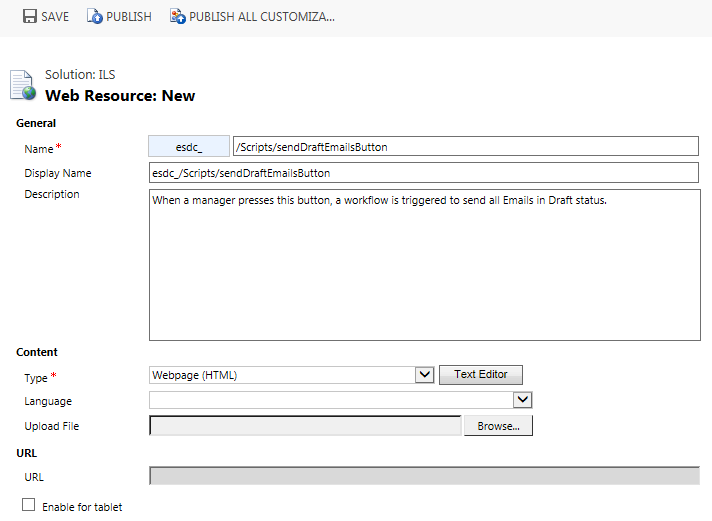 Save and publish your customizations and now you can take a look at your form and test the button. Press F12 before pressing your button to use the debugger and step through your code.